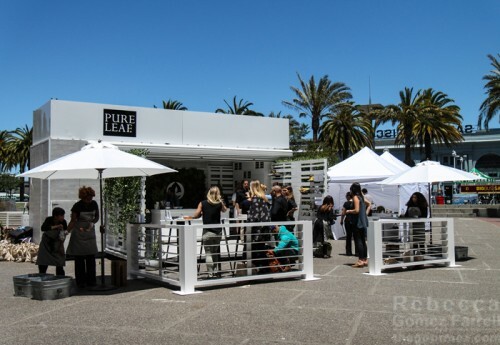 Home / Dining in San Francisco - CA / Pairing Pure Leaf’s Tea House Collection with SPQR’s Finesse! Last week, I had the pleasure of trying Chef Matthew Accarrino’s cooking for the first time. No, I didn’t try it at SPQR, the Michelin-starred restaurant the chef calls home. I sampled it at a travelling tea house! Pure Leaf is in the midst of a tour of major food-loving U.S. cities to promote their newest products, the Tea House Collection, and I was invited out for a media preview of their stop in San Francisco, where Chef Accarrino prepared dishes using the teas. Like all of Pure Leaf’s iced teas, these debutantes are steeped with whole leaves rather than mixed with a powder, but what really sets them apart is all organic ingredients and more adventurous flavor combinations — I’m mainly in it for the adventure. Even the product displays had a little wild in them. The three teas are Fuji Apple & Ginger, Sicilian Lemon & Honeysuckle, and Wild Blackberry & Sage. All the ingredients were arrayed for us to sniff and touch, and I admit, I don’t think any of them are that adventurous of combinations (I even developed a berry and sage cocktail just a few months ago), but they are good ones. We sampled them while working our ways through Chef Accarrino’s dishes, and the Fuji Apple & Ginger emerged as my favorite. Being a green tea, its embrace was light and fleeting, perfect for these hot summer days we’ve been having. It’s also perfect as an ingredient in Chef Accarrino’s almond cake bars. Yes, I’m beginning with dessert and I’m unashamed. Impressed by the bars’ boldness, I asked Chef Accarrino what spices he’d used. None! The spice-like flavors came from adding the Fuji Apple & Ginger tea to the dough. 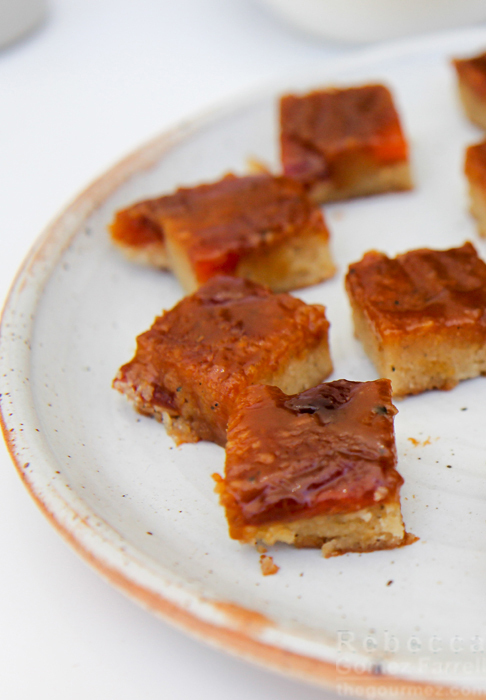 The bars were very moist and boasted a top layer of feisty peaches embedded in caramel. I hope SPQR is smart enough to add it to their dessert list. But man cannot live on sweets alone–or can he? Shall we test that theory? 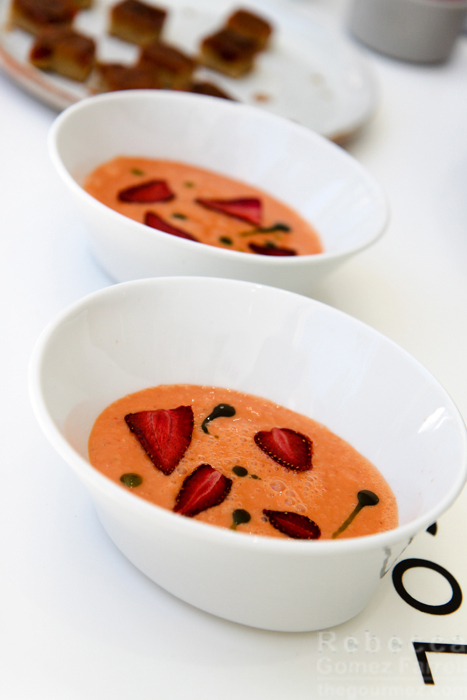 While sweet from natural fruit sugars, this strawberry dish is not dessert but a gazpacho-like combination of cucumber, tomato, bell pepper, basil, and jalapeno pureed into smoothness with the strawberries. Accarrino used Pure Leaf’s Sicilian Lemon & Honeysuckle tea for this one. It’s the most conventional combination in the Tea House Collection, as it’s a pretty close approximation of a standard black tea with more delicate lemon and honey notes, but using it makes a lot of sense in combination with the soup’s ingredients. The gently dehydrated strawberry garnishes add an essential pop to the dish that fresh strawberries on their own would not. You can find the recipe for it at the end of this post. This gentle cocktail reminded me a lot of the Bon Affair Sauvignon Blanc wine spritzer I reviewed last fall. Both are slight, with fleeting impressions of minerality. 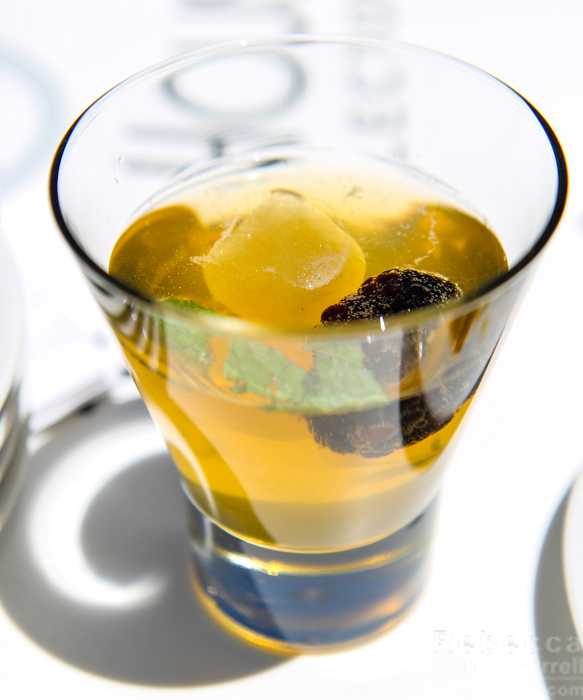 The Wild Blackberry & Sage tea was featured, though it didn’t have a strong presence–you’ll be fine with this drink even if you don’t like black tea. This is a cocktail for thirst-quenching, one that won’t weigh you down. 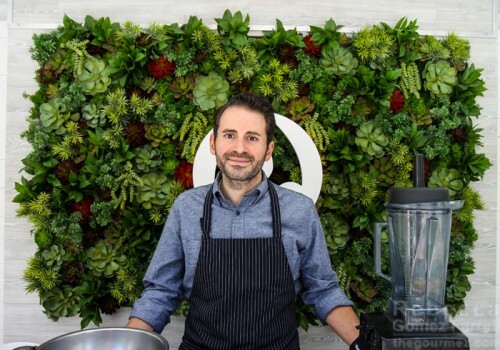 To accompany Chef Accarrino’s tea-based creations, he prepared an Israeli couscous pesto salad, polenta with an extra punch of parmesan, meatless meatballs, and my favorite: slow-roasted Wagyu beef sliced thin. 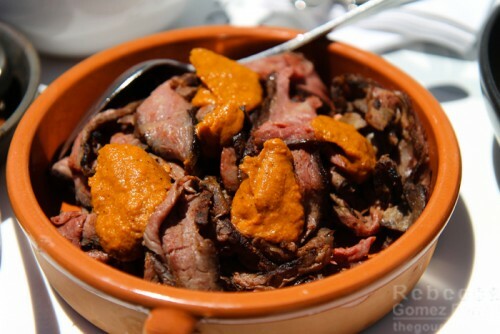 The expert char on that beef, accomplished while keeping the meat itself incredibly tender, is enough on its own to convince me a visit to SPQR is required. 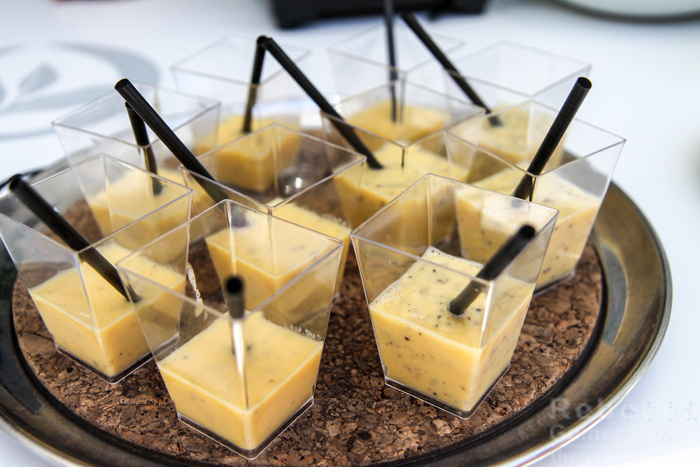 The accompanying sauce, a version of the summer soup’s ingredients minus the strawberries, was also delicious. The earthy roast and vibrant veggies complemented each other well with contrasts. The Fuji Apple & Ginger tea was also used in a green tea smoothie. Per Chef Accarrino, it makes for a great refresher after a bike ride. I found it too gritty, though I loved the extra crunch from the chia and flax seeds. Is it worth it to lose the crunch and gain a smoother blend? A conundrum! The Pure Leaf Tea House Collection highlights deft handling of subtle dried plants, tea and otherwise, showcasing them in a way that seeps into your skin rather than hits you over the head. Chef Accarrino prepared inventive dishes that worked in a similar fashion, incorporating the teas as foundational ingredients rather than headliners stealing the stage. The almond cake bars and chilled summer soup were especially delightful, and I thought it a great parting touch that we we’re given swag bags full of the soup’s ingredients, fresh from a nearby farmers’ market. Obligatory disclaimer: Those were free, along with everything sampled and experienced at this media preview. You can have the same experience I had! Or at least a facsimile of it. Pure Leaf will be sampling their new teas at the Ferry Building Farmers’ Market on 6/30, 7/2, 7/7, and 7/9. Pick up a bottle of the Sicilian Lemon & Honeysuckle to use in that chilled summer soup recipe copied below. I’ll share a few more of Chef Accarrino’s recipes throughout the season. Thank you, Pure Leaf and Chef Accarrino, for inventing them! 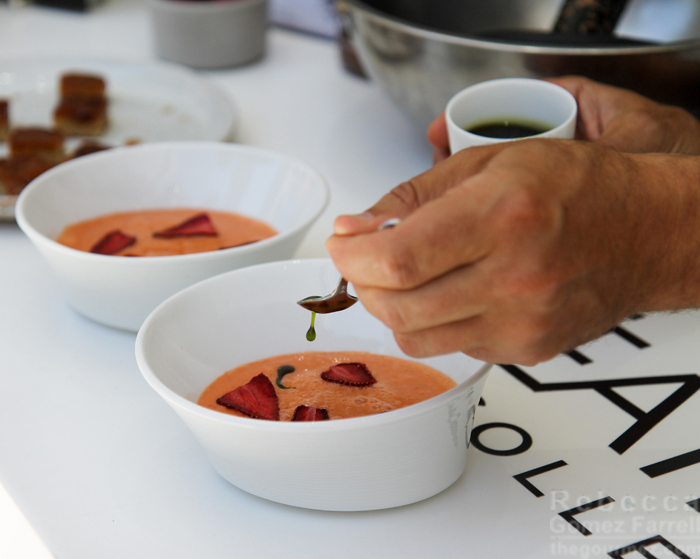 Chef Accarrino garnishing the summer soup with basil oil. A Tip From Chef Accarrino: You should always taste test your peppers’ heat levels before using them. Adjust how much to add to a recipe accordingly. Your opinion may vary from the recipe’s proscribed quantity. For example, I’d have liked more heat than the chef used, but another food writer at the event thought it was already a little too much! Combine all ingredients and rest overnight, minimum 4 hours, in refrigerator. Blend finely. Serve soup chilled with herb oil and topped with strawberry chips. Event took place 23 June 2016. 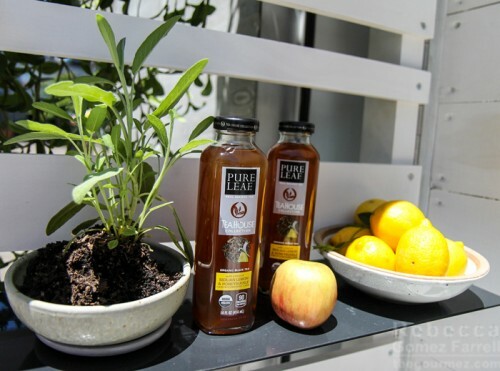 3 thoughts on : Pairing Pure Leaf’s Tea House Collection with SPQR’s Finesse!